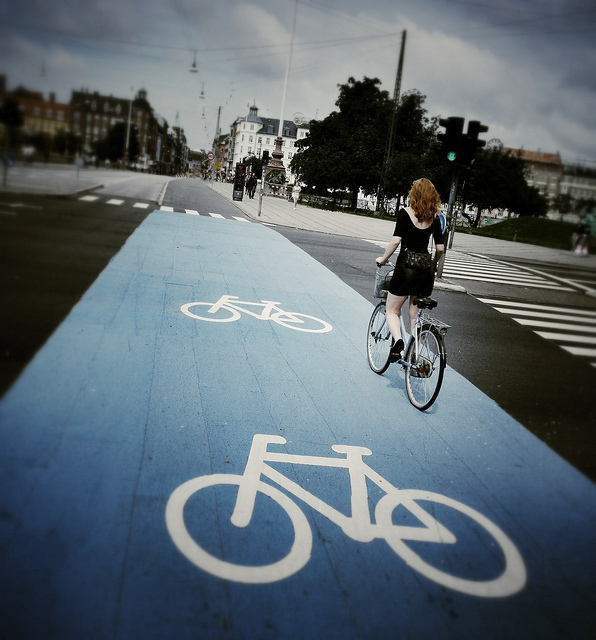 I have not actually been to Denmark, but there appears to be a lot about cycling there that is rather good, that the UK needs to learn from: like this genuinely super-looking Copenhagen Cycling Superhighway, photographed by Marc van Woudenburg of Amsterdamize (but it does look rather deserted). I was therefore most interested to see that the Cycling Embassy of Denmark has published a document with the appetising title Cycle Campaigns in Denmark. I would have hoped that such a document would provide information to UK cycle campaigners on how cyclists in Denmark had campaigned so successfully for the sort of fantastic infrastructure pictured above. Alas, it turns out that this document is nothing like that. By "Cycle Campaigns", the Danish Cycling Embassy means here something totally different to what I expected, and, unfortunately, something not uniformly good either. By "cycle campaigns" they mean propaganda campaigns by the authorities, for example local town councils, to persuade more people to use their cycle infrastructure. The existence of the effective, quality cycle infrastructure is assumed, and not dealt with in this document, with no discussion of how or why it came to be built in the first place. So this is really no no use to cycle campaigners, or indeed politicians or officials, in a place like the UK. For exmple, on Page 9, "Fair wind on the cycle track" it talks about a campaign in Odense to get car drivers to switch to electric bikes, and shows a picture of a congested road full of cars, with an extremely-well separated cycle track to the left of it, separated from the road by several types of barriers. The problem here, from a UK perspective, is that, in our infrastructure, we simply don't have the whole left-hand half of this picture. We only have the right-hand half, the congested road full of cars. We are many stages back from the meaning of the word "campaign" that the Danish Cycling Embassy is using, we don't have the basic infrastructure that is the prerequisite of all that they are talking about. So all this is really no use to us, but I can just see the contents of this document being taken up and quoted out-of-context by many in the UK cycling world, who love nothing more than to dwell on promotional campaigns for cycling in the absence of any intention of the UK authorities to build usable infrastructure for cycling, and who will say "This kind of publicity campaign is how they have achieved a high cycling modal share in Denmark" – when it clearly is not. There are echoes here of the misleading release put out by the Dutch Fietsberaad on the subject of cycling in Raalte, the town with "a high percentage of bicycle use without any clearly visible reasons", when actually it has very clearly visible physical reasons for its cycling success – a release which did get taken up by the UK's Cyclenation website. Unfortunately, Cycle Campaigns in Denmark gets worse. On page 22 we read about "Promoting the helmet in a positive way" in Aalborg. I am afraid there can be nothing positive about promoting cycle helmets. Promoting cycle helmets means promoting a culture of unnecessary fear around cycling that drives people away from it, whether in Denmark, Australia, the USA or the UK. This is actually undoing the work of the rest of the "cycle campaigns" that the document wishes to tell us about (and perhaps it explains the deserted Cycle Superhighway pictured at the top of this post). Rather than read this document, watch this video from fietsya which demonstrates Dutch attitudes to cycle helmets, the attitude in a really safe and healthy cycling culture. Or, if you wish, read up on the minutiae of the evidence around helmets from War of the Motorist, in several superb posts from July 2011. There may be lots that is great about cycling in Denmark, but I am afraid the Cycling Embassy of Denmark have rather shot themselves in the foot with this document. Perhaps it is best for them that it is not downloadable (though I am sure some wizzkid will crack that one soon enough). It would be nice if there were two spectacular, excellent examples of national cycling cultures going in the right direction in Europe, but it appears this is not the case. We'll just have to go back to looking at View from the Cycle Path for inspiration. David, excellent post, my compliments. However, Fietsberaad.nl has the most extensive bike policy knowledge base available online, mostly free, some upon request. And many of it is available in different languages, including English. It's also good to point out that I'm involved in the founding of the Netherlands Cycling Embassy, and we aim to continue the good work of Fietsberaad International, but more comprehesively. So we're looking forward to be able to cater to every possible need. As you undoubtedly know, David Hembrow has repeatedly expressed the opinion, supported by research, that cycling in Denmark is often over-hyped. Cycling in Denmark is almost certainly better than the UK, but certainly AFAICT nowhere nearly as good as the Netherlands.